However, the paper actually says that "such a tight sequence of 5 strong cycles over 6 successive cycles (from 17 to 22, except 20), which we can call the “Modern Maximum”, is still unique over at least the last four centuries," and "The recalibrated series may thus indicate that a Grand Maximum needs to be redefined as a tight repetition/clustering of strong cycles over several decades, without requiring exceptionally high amplitudes for those cycles compared to other periods." "Still, although the levels of activity were not exceptional except maybe for cycle 19, the particularly long sequence of strong cycles in the late 20th remains a noteworthy episode. Indeed, the 400-year sunspot record and one of its by products, the number of spotless days, show that such a tight sequence of 5 strong cycles over 6 successive cycles (from 17 to 22, except 20), which we can call the “Modern Maximum”, is still unique over at least the last four centuries. Given the inertia of natural systems exposed to the solar influences, like the Earth atmosphere-ocean system, this cycle clustering could still induce a peak in the external responses to solar activity, like the Earth climate. However, we conclude that the imprint of this Modern Maximum (e.g. Earth climate forcing) would essentially result from time-integration effects (system inertia) [i.e. the sunspot time-integral], since exceptionally high amplitudes of the solar magnetic cycle cannot be invoked anymore. In this suggested revision, the estimated or modeled amplitude of the effects, including the response of the Earth environment, can be quite different, necessarily smaller, and should thus be re-assessed. The recalibrated series may thus indicate that a Grand Maximum needs to be redefined as a tight repetition/clustering of strong cycles over several decades, without requiring exceptionally high amplitudes for those cycles compared to other periods." In conversations with Leif Svalgaard at WUWT he appeared to take the view that his 'flattening' of the solar activity record supported his belief that the sun was NOT responsible for climate variability. He insisted that climate variability was simply an internal system phenomenon. I pointed out that, despite all that flattening, the basic pattern of rises and falls remained intact so that if there were an amplification mechanism internal to the Earth system even those smaller variations could, over time, result in changes in the accumulation of solar energy within the Earth system. He did not accept the logic of that but now we have multiple papers arriving that do indeed point to suitable amplification mechanisms. Leif could still argue that those amplified responses are an internal system process but I would say that the sun does nonetheless appear to be the ultimate cause by changing atmospheric chemistry above the tropopause so as to alter global cloudiness and thereby change the proportion of solar irradiation that is able to enter the oceans to fuel the climate system. Leif's paper above says the Sun indeed could be considered to be at a "Grand Maximum" if one simply changes the definition of a Grand Maximum to the time- integral of solar activity, which is, of course, how a Grand Maximum should be defined with regard to accumulated effects on Earth's climate. Strange that he never expressed it that way before when he had innumerable opportunities to do so. He chooses his words carefully, as he should given his position. That is likely why his responses run the way they do. Stephen you have more freedom in what you can say. Then as for me, I get to play the part of Nostradamus given the way I approach the climate conversation. Until the day comes that you can fully outline your lines to show the links to the mechanisms which interact to create the Earth,s climate, then Leif will always respond with his standard response. It is getting very interesting as more pieces of the puzzle show themselves through the efforts of all involved. And the results, from 1808-1908: 4,735 sunspots; and from 1908-2008: 6,197 sunspots – a 31% increase in solar activity in the last 100 years compared to the previous 100 year period (not including SC24). I’d call that a modern maximum! Sunspot activity is steady over the last 250 years"
I think your first graph is wrong (sunspot data too high at the start). It doesn't match your first reference which I believe is the source. The first graph is not "wrong"
It is based on Dr. Svalgaard's SSN data linked above. Dr. Svalgaard's data shows in 1614 the SSN was very high at 214.7, the highest in the entire 400+ year SSN record. The link you cite is a post by Dan Pangburn which uses a different SSN dataset and slightly different methods to produce the "sunspot integral" as described in that post. 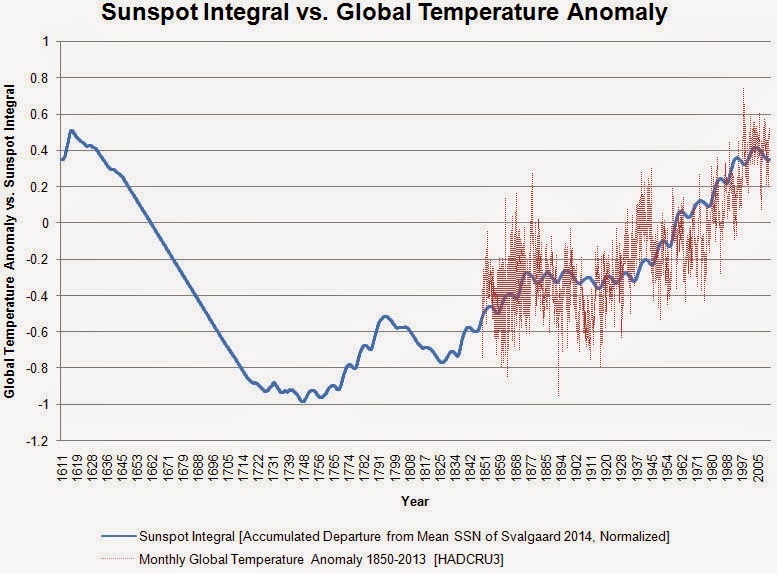 If we're really serious about understanding if and when sunspot activity had anything to do with global warming, we ought to start evaluating from the time when the running average annual SSN is the highest (going back from now), which is 68.9, 1936-now. The previous 187 years to 1936, 1749-1935, had an average of 50.8, a difference of 18.1, making the 1936-now annual average 35.6% higher. If we're really, really serious, we have to acknowledge that solar cycle #24 played no part in the modern maximum and certainly not global warming, as warming ended at least over a decade ago, and we should write off solar cycle #23 after it's peak having any influence over global warming either. That brings us to view the 68-year period from 1936 to 2003 as defining the Modern Maximum era, when the average annual sunspot number (GSN) was 73.5, 22.7 higher, or 44.7% higher, than the prior 187-year average of 50.8. Also, the 1936-2003 Modern Maximum annual average GSN was 30.8% higher than the 266-year GSN annual average. "Grand" or not, it was an extended period of significantly higher solar activity. The "Modern Maximum" happened! Funny how AGW alarmists use decadal averages to try to claim it's still warming, but won't have anything to do with decadal averages of solar activity. The question is whether or not the new numbers will save solar physicists from wrath of the public they deceived for the past seventy years (1945-2015).